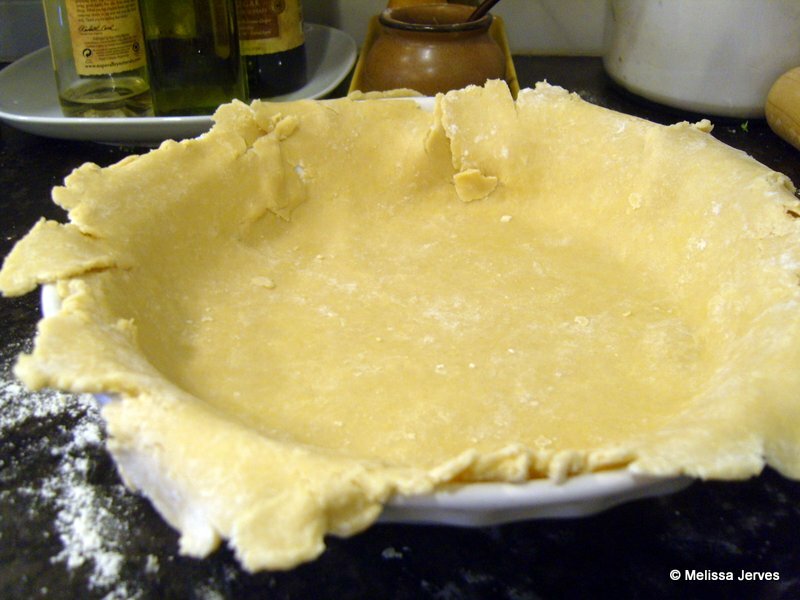 To be honest, I’ve been struggling with pie crust lately. Blind baked crusts have been emerging from the oven shrunken and puffy, and my pretty crimped edges have turned out deformed. I suspect it’s a case of trying too hard, attempting techniques from a variety of recipes from memory–a faulty and distracted memory, unfortunately. 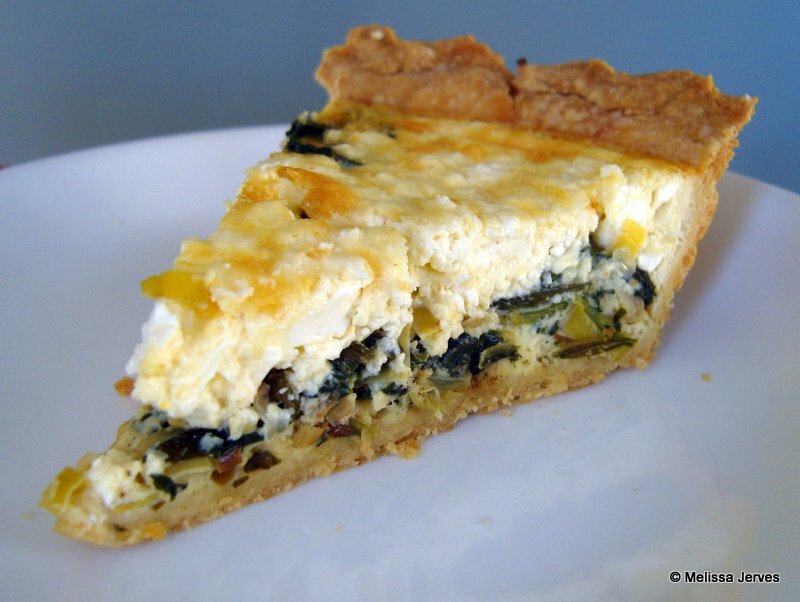 I had spinach, feta and some leftover sliced leeks in the fridge when I made this quiche. You can vary the filling ingredients all you like, but this combination was particularly rich and tasty. We ate it for dinner, and finished the rest for breakfast. 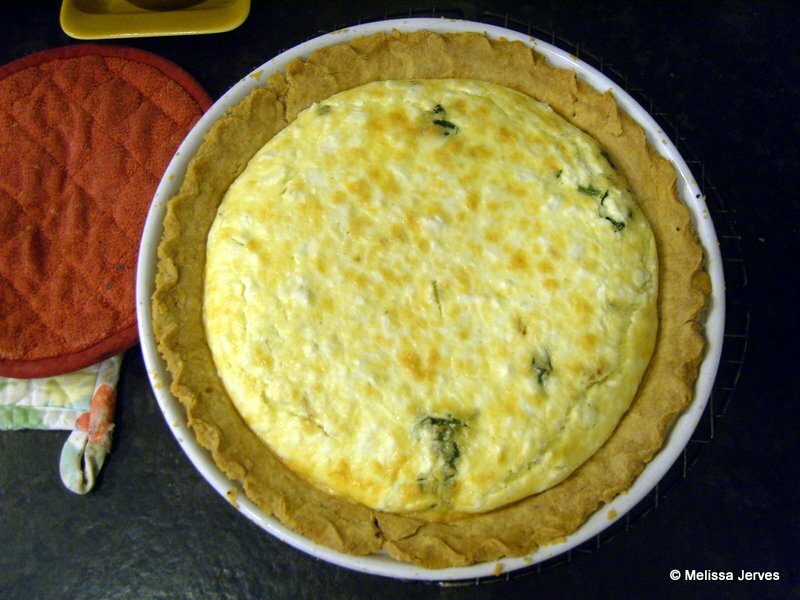 Quiche is something I can eat any time of day or night. It’s the little black dress of mealtime. Accessorize with a green salad and a glass of wine for dinner, or add a cup of coffee and some fresh fruit for breakfast time. And that’s all the fashion advice I’ll be giving out around here. Promise. Sauté the leeks in the butter over medium heat until they are soft and lightly caramelized. Add the spinach (I ripped the larger leaves into smaller pieces) and stir into the leeks. Cover for a couple minutes until the spinach is wilted. Remove from heat and let the mixture cool. In a large bowl, combine flour, cornstarch and salt. Add the chunks of cold butter and cut it in with a pastry blender (or use the food processor). With a fork, stir in the egg and mix until a dough forms. You may need to use your hands to press the dough into a ball. Roll the dough into a 12-inch circle. Place the dough in a deep dish 9-inch pie plate or tart pan. Trim and crimp the edges and chill for at least 30 minutes. Heat the oven to 350 degrees. Whisk together the cream, sour cream, eggs, nutmeg and pepper in a large bowl. 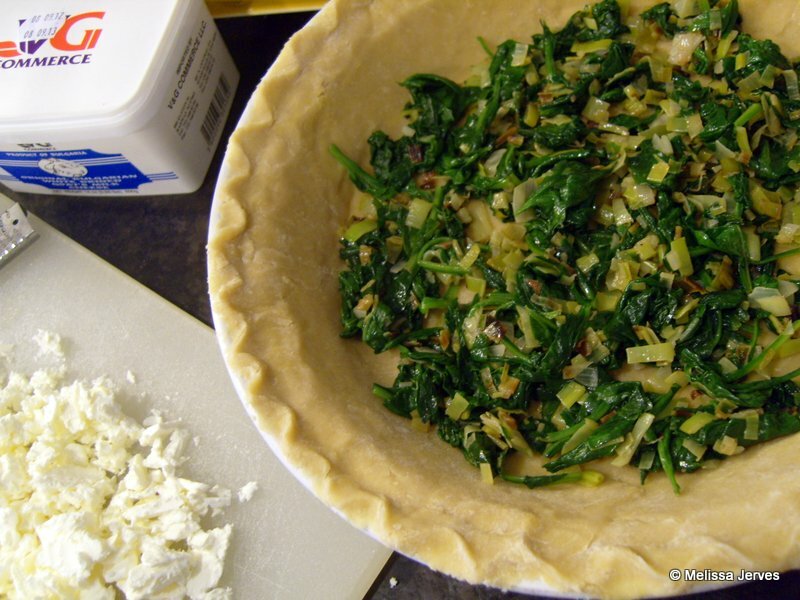 Spread the leek and spinach mixture into the pie shell. Add the crumbled feta, then pour the custard on top. Bake until puffed and golden, 30-45 minutes. Cool on a wire rack.